Feel better vibes to you and yours! p.s. 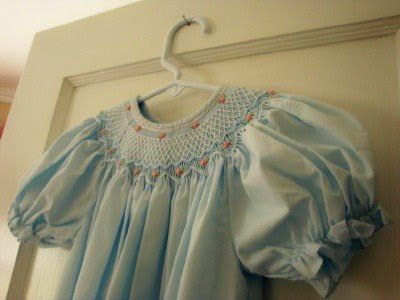 I have that EXACT smocked dress packed away in the attic...I had Miss C's picture taken in it when she was a year old. I am sorry that you (or others in your home) feel sick. Hope all of you are better soon. Now, how in the world do you find all of the wonderful blogs that you link to? I am always blown away by what I read. Some of these dear ladies are sure women like my own heart. oh no - hope everyone gets better soon. It is really going around. Love those type of dresses! Thank you for linking me today! I have enjoyed visiting you today too. Mystery solved! I was wondering who had linked to my post on making crackers...I had so many new commenters. Thank you. Have you tried making crackers before? I was surprised at how easy these recipes were & how delicious! PS- I love the yellow walls. So cheerful! Just like you! I just love stopping by your blog. Your posts are always so short and sweet, but packed full of information. You really have a gift. get better, friend! in time for Easter! I was wondering why all the sudden people were commenting on that post :). My blog doesn't normally see that much traffic ;). Thanks for linking to me, you made my day!